A LIMS solution must be able to meet any regulatory requirements that are in force. Laboratory information management systems (LIMS) are used extensively in laboratories in a huge number of industries to manage, track and report on samples, tests, test results and more. In manufacturing industries laboratory testing can be involved at every step, from raw material analysis through to the finished product. Many of these industries are strictly regulated and the laboratories within them will also be regulated, so any LIMS will need to comply with these requirements. Examples include current Good Laboratory Practice (cGLP), current Good Manufacturing Practice (cGMP) and FDA 21 CFR Part 11 in pharmaceutical companies, NELAC and ISO 17025 in water and food testing laboratories or NAMAS/UKAS regulations, Good Clinical Laboratory Practice (GCLP) for clinical trials and HTA, GCLP, MHRA, FDA 21 CFR Part 11 and other similar requirements in biobanking. When a LIMS solution is adopted into one of these and other industries it is essential that it can be shown that it meets whatever regulatory requirements are in force. In the pharmaceutical and medical device manufacturing environment, GMP is a key regulatory requirement. Here, we look at the 10 key principles of GMP. The GMP principles put forward by the US Food and Drug Administration help ensure quality of manufactured product throughout the manufacturing, processing and packaging stages. They are used to create a quality framework for the manufacture of a wide variety of products including drugs, medical devices, some food, and blood to make sure that the products are safe, pure and effective. GMP principles address a wide range of issues as varied as recordkeeping, personnel qualifications, sanitation, cleanliness, equipment verification, process validation, and complaint handling, but offer individual manufacturers the flexibility to decide how to implement the necessary controls in the most appropriate way for their particular business. Pharmaceutical quality control laboratories have an important function in both raw material evaluation and production and can significantly impact overall manufacturing performance. Enhancing laboratory productivity leads to improved manufacturing efficiency, and information management in laboratory operations is essential to improving laboratory efficiencies. Using a LIMS to control, manage, organise, document, analyse and report information leads to improved efficiency and functionality of data storage and manipulation. The system is likely to be required to manage data for a wide range of analytical techniques for the raw materials, intermediates and finished products. Raw materials and finished products have to conform to pharmacopoeia and relevant product licenses. Any LIMS used must be compliant with all of the relevant regulations and practices such as cGLPs and cGMP. 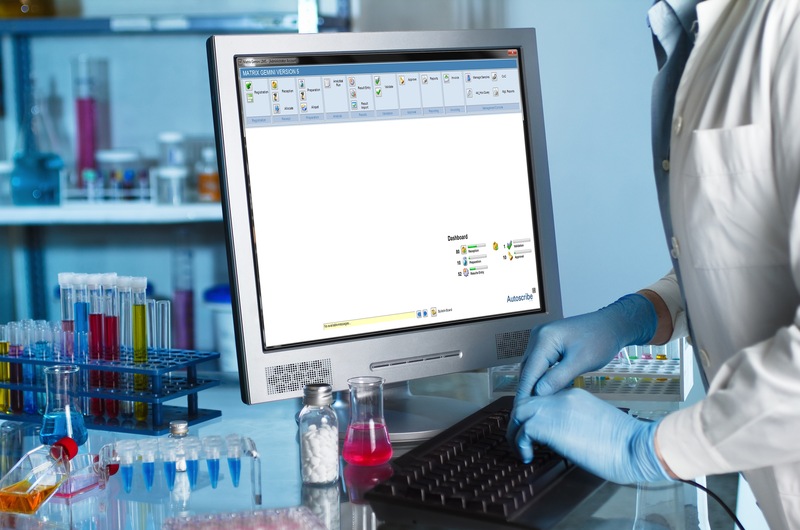 Matrix Gemini is a configurable LIMS solution that requires no coding to create a system that matches the specific requirements of a pharmaceutical quality control laboratory. The easy to use configuration tools allow the definition of screen and menu designs, customer-specific tables/modules and multiple screens for the same function (e.g. different log-in screens for different product classes such as raw materials and finished products). 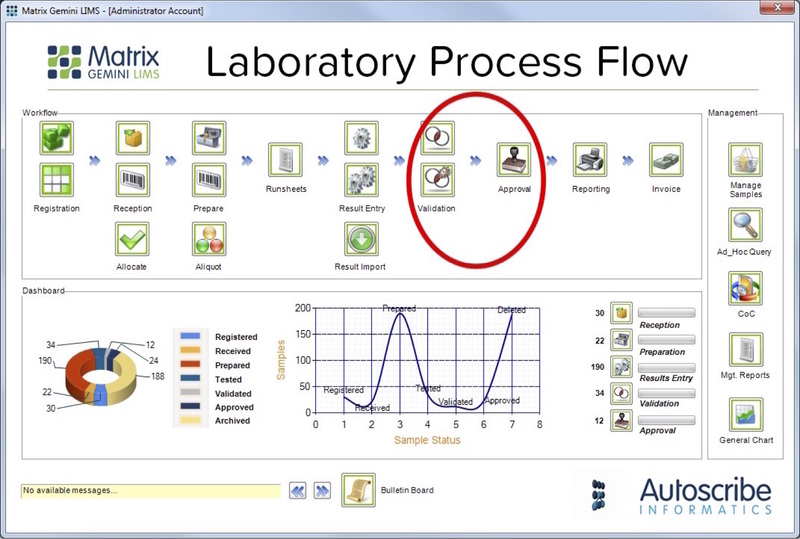 The workflow user interface graphically represents the progress of a sample through the laboratory. Matrix has the tools and design to help with compliance with cGLPs and cGMPs including audit trails, time and date stamping of all actions, version control of all reference data such as test definitions and extensive features to help with 21CFR Part 11 compliance such as data entry authentication and comprehensive password management capability. 1. Defined operating procedures and work instructions to establish controlled and consistent performance. Standard operating procedures (SOPs) and work instructions are stored and maintained within the integrated document management system. They are available for users to reference directly from Matrix Gemini. 2. Adherence to written procedures and instructions. SOPs and work instructions are available for users to reference directly from Matrix Gemini. Relevant SOPs can be presented based on the current user task, and visual workflows guide users through the laboratory process. By defining access rights, and managing competency records, users are only able to carry out tasks relevant to their function and for which they have been trained. 3. Prompt and accurate documentation of work for compliance and traceability. As users complete workflow tasks or actions within the LIMS an electronic signature can be created that records who completed the action and when. A reason for the action can also be recorded if necessary. Data entered is recorded directly in the database at the time of entry. Analytical results and the ID of the instrument used can be captured automatically, removing the possibility of transcription errors and a record of media and reagents used can be maintained. If users can modify data within the system an audit trail can provide access to a complete history of the changes made (Fig. 1) including who, when, why and the changes made. 4. Prove that the systems do what they should through validation. Matrix Gemini can manage data and information that supports system validation (Fig. 2). For example, instrument calibration and sensitivity measurements and records can be managed through LIMS and are easily accessible for validation purposes. QA/QC information has always been a fundamental of LIMS and Matrix Gemini can be used to validate the accuracy of in-line analysers and process analytical technology (PAT) processes. 5. Properly defined and designed system and equipment. A LIMS solution can help validate and ensure facility, system and equipment suitability. As an example, facilities must be designed to prevent contamination (microbial, particulate or cross contamination). An environmental monitoring facility within a Matrix Gemini LIMS will allow the setup of sampling points within a sample location, i.e. within a sterile filling facility the air vents, bench tops and the filling machines themselves need to be monitored for contamination. The tests (and associated limits) and testing frequencies required for each sampling point can be defined. Results are recorded and alerts triggered for out-of-specification results. Previous results can also be reviewed to identify possible trends. 7. Define, develop and prove job competency. Training and competency records can be maintained within Matrix Gemini, and it is possible to prevent individuals carrying out specific tasks if they do not have a valid training record. 10. Perform regular audits to ensure compliance. The Austoscribe LIMS supports the audit process (internal and external) by providing access to required information from a single integrated source. Training records, instrument calibration and maintenance records, the results of QA/QC testing and other relevant information can be recorded in, and retrieved from, the LIMS database together with required electronic signatures and audit trail. The ability of Matrix Gemini to meet these GMP requirements is extremely important. The failure of organisations to comply with GMP regulations in any context can result in very serious consequences. These include internal direct costs related to product failure, scrap, etc and remediation costs related to problem identification, correction and reporting. There could also be significant external costs such as regulatory action costs related to recalls, discontinuation, suspended operations, etc. There may be costs associated with loss of market share due to reduced product volume. There is also the cost associated with damage to the company’s reputation, which can even affect share value. Dr Simon Wood is with Autoscribe.